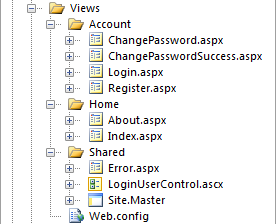 In ASP.NET MVC, the view is the presentation of your applications' business layer or model. Typically with ASP.NET MVC this is HTML, but your view can be rendered in any form that can be transmitted over the internet, including JSON, XML, binary, RSS, ATOM, and your own customized protocol if you have one. These dynamic ranges of views that, allow it to be capable of such a wide range of delivery types in the ASP.NET MVC Framework are because of a provider engine appropriately called the view engine. The view engine is responsible for taking the controller and action names and then delivering the right view based on these names. When I talk about the view engine from here on forward, I will be specifically referring to the ASP.NET MVC implementation, called WebFormViewEngine, which is based on the aspx, ascx, and master files. There are many other types of view engines, such as Brail, NHaml, NVelocity, and XSLT that are available from the MVC Contrib project located at www.codeplex.com/mvccontrib, if you are interested in learning more. The default ViewEngine in the ASP.NET MVC Framework, the WebFormViewEngine, uses a hierarchy of folders and aspx and ascx files when rendering HTML pages to the browser. The WebFormViewEngine, uses the standard ASP.NET Web Forms rendering engine that has been present in the framework since version 1.0, however the emphasis has been moved from control based rendering to an inline code based rendering that is reminiscent of its predecessor, plain old ASP. Let's take another look at the hierarchy that the default view engine uses, as seen in Figure 2-24. The view engine treats aspx and ascx files almost equally, so that it is possible to render your HTML from an ascx or user control file, in the same way that an aspx or page file works. As you can probably imagine there needs to be a hierarchy or order to which an aspx or ascx file is picked from the controller or Shared directory in Figure 2-24. The default ASP.NET MVC view engine uses the following lookup order, from top to bottom, when trying to determine which view to render. Controller directories are always checked before the Shared directory. aspx or page files are always checked before the ascx or user control files. Now that we have learned how view pages, controls, and master page are selected let's take a little closer look at the files themselves. In ASP.NET MVC there are three new takes on objects that you are probably familiar with from ASP.NET Web Forms. These types probably come as no surprise, given what we just covered in the ViewEngine section and the title of this section, but they are as follows listed with their Web Form equivalent. ViewMasterPage MasterPage Responsible for providing a template to the page object. ViewPage Page Responsible for the main content of the web page being viewed. These object types in MVC are actually inherited from their Web Form counterparts, because they rely on their built in execution, in the ASP.NET Core, as a way of delivering the content through the servers such as IIS. So all the interfaces you have become acustumed to (i.e. User, Context, Request, Response, IsPostBack, etc.) are still available in the MVC version of the page, user control, and master page. Yup, that is all that is required, pretty cool huh? This is possible because all the application logic that used to be in button clicks, post backs, and other event actions, has been moved to the controller actions. It is actually considered bad practice in ASP.NET MVC to put any code in the code-behind file. We have covered the basics of how views are rendered and found and the differences between MVC views compared to their Web Form counterparts. We will be going in to a great depth of detail on programming views in later chapters of this book. However we are not quite done, there are a couple more basics things I want to cover before moving on to The Controller section. These include special properties designed to allow easy communication between the model, controller and view. I have broken up the properties in to logical sections, so that we can discuss the purpose and intended use of each of them as envisioned by the ASP.NET MVC team. It is a very versatile collection that is available to both the views and the controllers, and is passed via the ViewContext, which inherits from the ControllerContext. The TempData property is a session-backed temporary storage dictionary, much like ViewData, which is available for the current request, plus one. What this means is that any data you store in the TempData is kept in the session storage for one additional request, beyond the one you're currently processing. A user comes in to your site unauthenticated and you have to redirect them to the login page, but you what to display a message saying they need to login before viewing the content, but that message should display only when they don't visit the login page directly. You can even put this code in your master page so that you can display a message to your user on any page in your site, and all that you need is these three lines of code in the view. As one added feature if you actually wanted to render the page with CustomerName already filled in, you would just need to set ViewData["CustomerName"], in the controller, equal to whatever you want to be rendered in the HTML. The this keyword is what is used to add these custom methods on to the HtmlHelper, which is represented as Html in the view pages, we will cover extension methods in greater detail later on in Chapter 6.